Many of our customers are particularly curious about a special category of super food known as ‘super greens’ and are extremely keen to learn more about them and how to go about adding them to their existing diet. 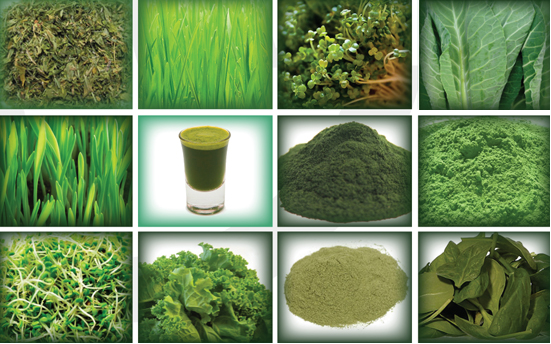 With that in mind, we’ve compiled some essential information on four of the most widely available super green supplements – spirulina, chlorella, wheatgrass and barley grass. Super greens are a unique variety of superfood comprising a selection of vegetables, grains, grasses and algae. They are naturally rich in fibre, vitamins, minerals, phytonutrients and antioxidants and tend to boast both a striking green colour and a commanding flavour. These days super green supplements come in a convenient powder, tablet or juice form, making it remarkably easy to obtain a quick boost of wholesome green nutrients, regardless of the season. Key facts: spirulina is made from blue-green freshwater algae, which contains a potent mix of readily absorbable nutrients including vitamins (B1, B2, B6, B12, E, K and beta-carotene), minerals (such as calcium, magnesium, potassium, phosphorus, iron, copper, chromium and zinc), trace minerals, essential fatty acids, amino acids, nucleic acids (both RNA and DNA), superoxide dismutase (SOD), polysaccharides and antioxidants. Once enjoyed by the Aztecs, low calorie spirulina is also extraordinarily high in protein – it actually contains an impressive 60 percent protein, which is significantly more even than meat (which only contains 27 percent protein). How to use: spirulina can be purchased in either tablet or powder form – spirulina powder is suitable for stirring into your favourite smoothies and juices or mixing into other liquid dishes of your choice. Key facts: chlorella is prepared from green freshwater algae that features a true nucleus and contains a huge selection of essential nutrients including chlorophyll (in fact, chlorella contains approximately ten times more chlorophyll than spirulina) protein, vitamins (especially B12), minerals (and in particular, high concentrations of iron), amino acids, nucleic acids, alpha, beta and gamma PPAR's (Peroxisome Proliferator Activated Receptors) and antioxidants. How to use: similar to spirulina, chlorella is available in both tablet and powder form and can be used in exactly the same way as its bluer cousin. Key facts: wheatgrass supplements are created from juicy, young wheatgrass shoots, which are extremely low in calories and brimming with vitamins (such as A, C, E and K), minerals (including iron, calcium, and potassium), fibre, protein (wheatgrass powder contains an impressive 24 percent protein, which is more than meat, fish and dairy products), trace elements (such as zinc, magnesium and selenium), enzymes, antioxidants, chlorophyll and beta-carotene. How to use: wheatgrass is available in a powder form that can be mixed into smoothies, shakes and protein drinks, in addition to a live wheatgrass juice that’s delicious just as it is. Alternatively, you can try sprouting your own wheatgrass to juice at home. Key facts: barley grass powder is extracted from the juice of freshly squeezed barley, a self pollinating cereal that belongs to the grass family and a distant relative of wild barley. It is virtually gluten-free and, like other super greens, offers a superb range of nutrients in a concentrated dose, such as vitamins (e.g. vitamin C), minerals (including magnesium, calcium, iron, potassium and sodium), fibre, protein and chlorophyll. In fact barley grass is believed to contain 30 times more vitamin B1 and 11 times more calcium than cow’s milk, 6.5 times as much carotene and nearly 5 times the iron content of spinach, and almost 7 times the amount of vitamin C as oranges. How to use: barley grass is most commonly available in a powder form that’s ideal for blending into your preferred smoothies, shakes and protein drinks.